As part of London Design Festival, Tom Dixon will host ELECTROANALOGUE, a gathering of digital innovations in the Coal Office, the brand’s new HQ and flagship shop in King’s Cross. This September, King’s Cross delves into the spaces where digital innovations and the physical world overlap with the launch of ELECTROANALOGUE at the Coal Office - Tom Dixon’s new headquarters. In collaboration with friends and partners Bill Amberg Studio, Teenage Engineering, Ege carpets, Spiritland, Formica and Kirkby Design, ELECTROANALOGUE will explore the impact of digital technology through a diverse range of installations and events. The Coal Office will become a creative hub, stimulating the senses through interactive experiences in sight, sound and touch. 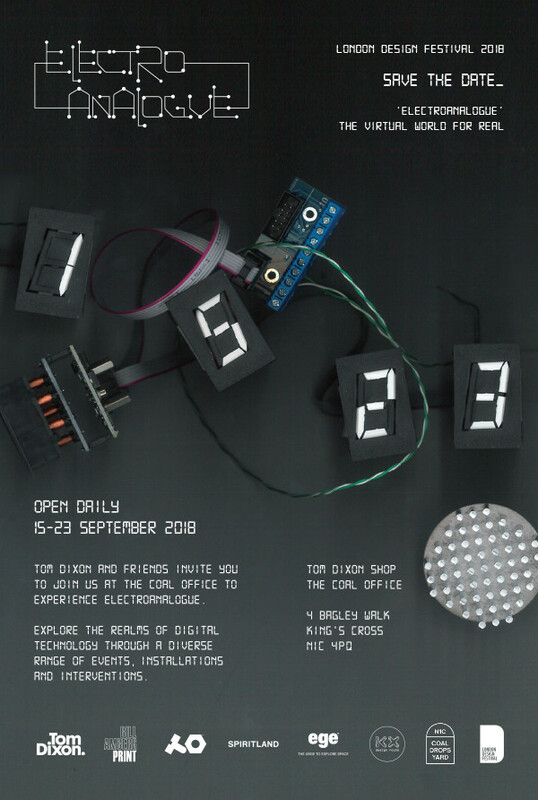 ELECTROANALOGUE is free and open to the public from 15 – 23 September 2018. Sign up to our mailing list to be the first to know more about Electroanalogue at this year's LDF. HYPER REAL, an exhibition exploring digital manipulation of materiality. Leather specialists Bill Amberg Studio have collaborated with Tom Dixon, Faye Toogood, Timorous Beasties and US-based interior designers Alexandra Champalimaud and Natasha Baradaran to develop individual designs, which have been digitally printed on cow hides. Bill Amberg Print is a modern take on leather decoration that employs specialist digital printing technology, whilst retaining the material’s natural character and grain. The inaugural range of Bill Amberg Print designs will launch at Electroanalogue, with a week-long showcase, alongside live upholstery demonstrations twice per day at 10am-midday and 2pm-4:30pm. Exclusive designs by Tom Dixon, Faye Toogood, Timorous Beasties, Alexandra Champalimaud and Natasha Baradaran will be available to view and purchase throughout the week. Formica Group globally leads the industry in the design, manufacture and distribution of surfacing products for commercial and residential applications. Tom Dixon and Formica Group have collaborated on HYPER REAL, a new collection of Formica® laminate patterns looking at interpretations of plastic, metal, earth and stone. For the HYPER REAL exhibition by Tom Dixon & friends, ege carpets provides carpets featuring the “Charred” motive created by Tom Dixon. On the 17th of September, ege designer Signe Fink Nørgaard demonstrates the process of transforming a design idea (for instance based on an image) into a carpet design. She also explains how the patterns and colours can be visualised digitally in a real life setting. 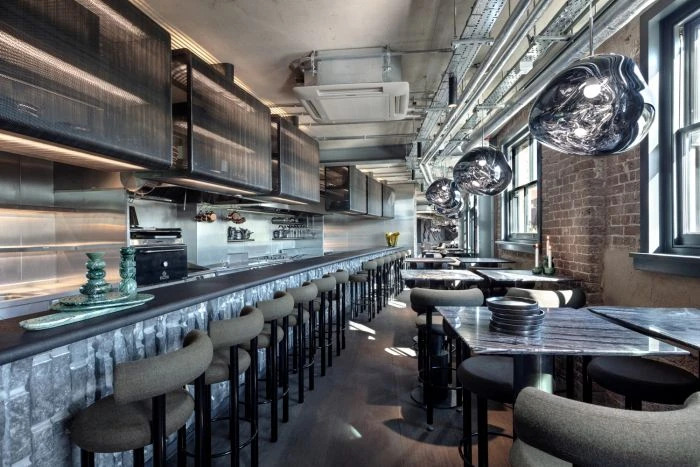 Besides the “Charred” design you will experience how other Tom Dixon images showing rocks, plastic, foil and fur are translated into soft flooring textiles. Contemporary British textile brand Kirkby Design has partnered with Tom Dixon in a one-off, special exhibition entitled ‘HYPER REAL’. A series of five graphic fabrics designed by Tom Dixon and developed by Kirkby Design will be showcased in a one-off, special exhibition entitled ‘HYPER REAL’, exploring digital manipulation of materiality. The exclusive designs will be hung, draped and upholstered in an immersive and kinetic installation. Teenage Engineering is a Swedish company that develops highly acclaimed products for people who love sound, music and design. The company's first product OP-1, the portable wonder synthesizer, is used by world famous artists and was unveiled 2010. A café, bar, radio studio and cultural space for music lovers has worked with Teenage Engineering to build an imposing sound system exclusively for London Design Week. Based on a vintage JBL horn-loaded Sound Power club system, it has been refurbished by Teenage Engineering for daily use at the Tom Dixon shop. Spiritland will also be selling the latest Teenage Engineering products from their venue on Stable Street, just around the corner from the Tom Dixon shop. 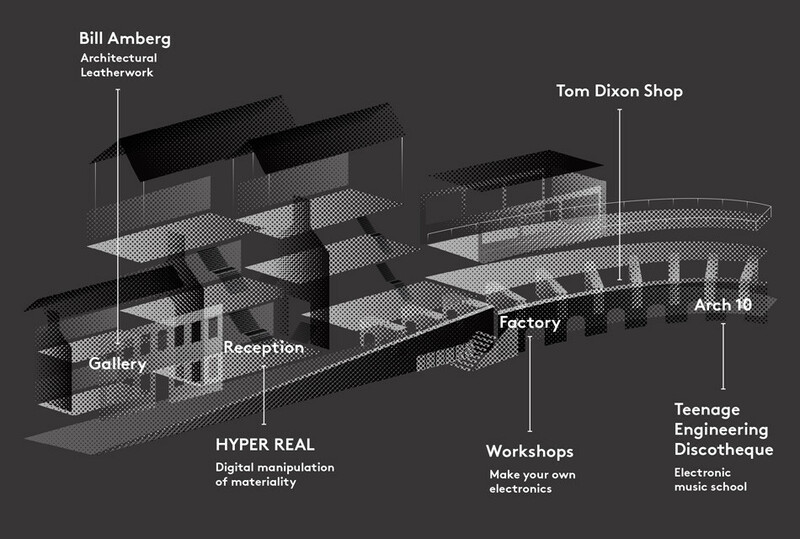 The Factory – Tom Dixon’s own in-house experimental production unit. Nostalgic for his early career in London manufacturing the Factory has been set up to prototype , test and fabricate pre-production batches of Tom’s latest hare brained schemes. With a rolling program of materials and processes being experimenting with the Factory is constantly evolving from pottery to pickles. For Electroanalogue the factory is experimenting with reconstituting electronic products and turning them inside out, celebrating circuit boards and creating functional sculptural objects. Visit our designers in the Factory working on the new and next generation of Tom Dixon products as we bring our studio into the heart of our retail space in the Coal Office. We will have experiments, circuit soldering lessons, one off’s, a small batch production of an etch pendant and a new rechargeable table lamp being built to order so you can own a one of a kind Tom Dixon product, exclusively available from the factory door. The exhibition is supported by Coal Drops Yard, the new shopping and lifestyle district in London’s King’s Cross, which opens on 26 October 2018.